The Carroll Creek projects in the City of Frederick, and future plans, lack two essential elements and features defining our long history and community: a site of historic relevance and an outdoor community event space. Both of these pedestrian centric goals might be served by utilizing an existing historic amenity and open space planned around the vacant colonial tannery building behind the former Frederick News-Post offices at Patrick and Carroll Streets. Our community stands at the crossroads of determining the future of the site based on planning and support towards a downtown hotel project. Thus, this crucial site, whose presence stands as a symbol of Frederick’s broad economic vitality, from colonial times to today, with components of significant archeological resources, stands threatened by bulldozers and five story tall modern private buildings. Frances notes the fire in the building, which was mostly confined to the upper floors, and not absolutely destructive of the building, whose central portion consists of early native stone walls. It is the last tannery building left in Frederick, one that produced leather goods from the 1700’s to 1952. It served as a nexus of various trades based on using supple tanned hides: to produce equestrian goods, shoes and gloves, carriage accessories, personal items, etc. From pouches for lead shot in the early republic to Civil War soldier’s accoutrements, the progress of the City is inherent in the place, and connected to our agrarian life past and present. The grain farms yielded to cattle, and the hides supplied a variety of goods manufacturers and trades. In addition, the tannery purchased tons of local timber, oak bark and sumac, to get the bark off they used a steam mill, and ash and guano were also consumed in the leather making process. A degree of significant, but limited archeological study was done at the site, but it proved so rich in items (1), (2), (3) from our earliest history to modern times, that it retains much potential for further study. 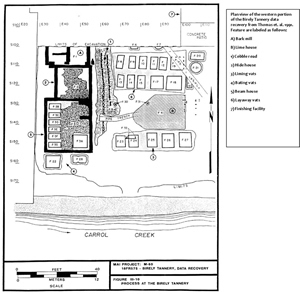 The Phase I study outlined a variety of outlying structures associated with the tannery uses left remnants in situ. Phase II digs yielded a trove of tools related to the tannery work and a variety of objects associated with the people who toiled at it. 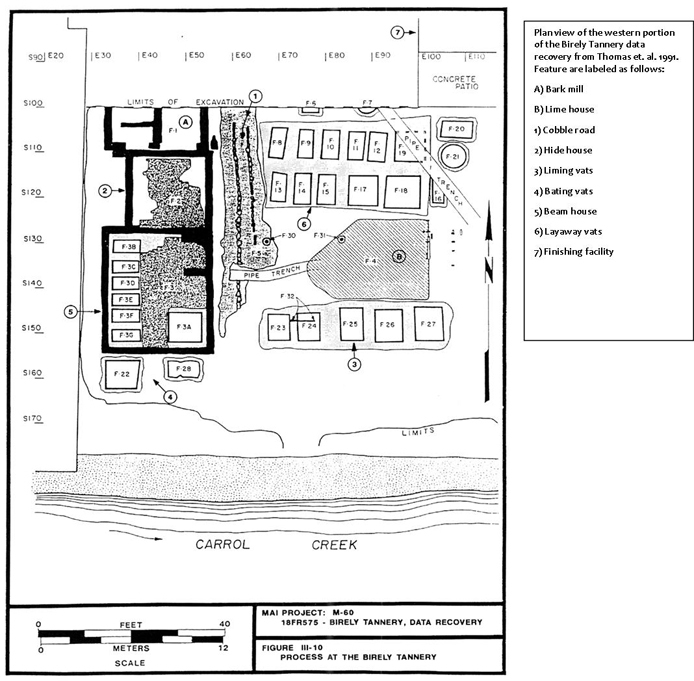 The only full, Phase III mitigation of the small portion of the site nearest the creek simply identified the white oak wood used in the many tanning vats found there. Given how Frederick’s great colonial past has been mostly covered over, the artifacts alone could prove worthy of display for future generations, yet alone the knowledge and insights to be gained by interpretation. This is far from the "sole of a leather sole of a shoe and old coke bottle" finds that have been suggested by some local leaders. It could indeed be argued that the Birely Tannery is the best available Colonial archeological site in the City of Frederick and most worthy of protection under the City's own archeological protection ordinances. The City owns the site (update 10/16/12 - a reader notes that tax records were incorrect, and that the Randall family still owns the tannery site), though it has suffered serious neglect and little more than disdain from planners. Will our progress pave over this significant site, or will we find a way to bring back our historical gem? Is the mercantile design of a downtown hotel in that single location worth the destruction of this last connection to mercantile trades and the building of our prosperous village? Well, our own economic development officials attempt to portray it as a "little white concrete building”. Meaning the bulldozers should arrive most any time without much troublesome, further consideration. The Birely Tannery site resides right on Carroll Creek, with one of the best and largest close in open spaces available. 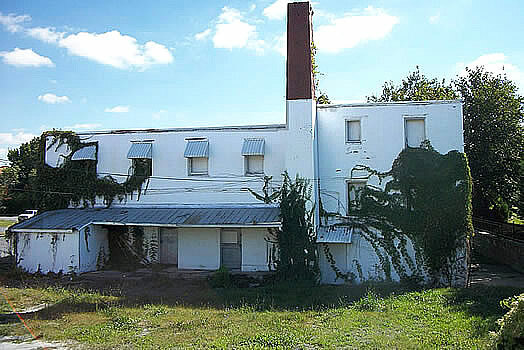 Given the abandonment of properties along the creek for development, it presents an opportunity to establish a community event space for the hands-on arts activities of festivals, and a space to do historic interpretations and demonstrate our heritage with live events. Being accessible to the Creek area it would augment the types of public events that draw visitors and shoppers to downtown. At a recent site visit by the Frederick Preservation Trust, a recently formed advocacy group for historic preservation in the city, one commenter suggested that the Carroll Creek bridge in front of it could be easily extended back to the center of the building, providing a pedestrian access to the structure. It is not an easy or quick goal, but perhaps also worthy of consideration would be a City history museum development around the existing historic trolley and newspaper building. It might also yield a space to include our rich African-American history here. Allied with a site of sufficient open space, office spaces, and proximity to the Creek and downtown, it could serve many capacities well. Preservationists know that not everything is worth saving, but when a correlation exists between the past and present needs and future advantages, it is worth the effort to achieve the best end uses of a site and historic structures. Frederick has always been a crossroads of past and future, here lays a viable context and a preponderance of reasons to showcase that character of our community.